The Northern Territory is a diverse region home to a rich history, ancient culture and an abundance of natural wonders. Some of the last remaining genuine outback, the Northern Territory makes up the central northern and mainland regions of Australia, bordered by South Australia, Western Australia and Queensland in the east. Also home to a rather unique range of wildlife, the Northern Territory is renowned as an adventurous and unforgettable holiday destination. Northern Territory accommodation is unlike most of what you find in the rest of the country. Although there are still hotels and resorts found in city centres or along the esplanade in Darwin, the rest of the accommodation is spread out across the wide red land of the Kakadu, Alice Springs and Ayers Rock. These types of accommodation present a much more unique experience including camping, safari tents, outback cattle stations and bed and breakfasts. However you choose to experience the Northern Territory, there's an accommodation option to suit your tastes and budget. A must see attraction of the NT, this sacred aboriginal site is popular with tourists and offers a great range of accommodation. Located in the tropics, this capital city is the gateway to the outback and offers a more modern range of accommodation. 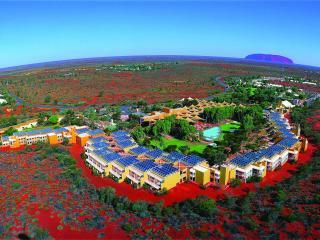 The largest town near Ayers Rock, Alice Springs offers a wide range of accommodation options and attractions. Accommodation is spread out amid the National Park as well as the nearby towns of Cooinda and South Alligator. The Northern Territory is an amazing holiday destination in central northern Australia that offers a unique range of unbelievable natural attractions in one of the last remaining outback regions. Contrasting the lush green of tropical Darwin with the arid land of the Red Centre, the only way to truly appreciate and experience this natural wonder is by getting up close and personal with its natural attractions. Northern Territory tours and cruises offer unprecedented access to Uluru (Ayers Rock), the Olgas, Kings Canyon, MacDonnell Ranges, Kakadu and Litchfield National Parks, the Katherine Gorge, Hot Springs and River Corridor. These tours and cruises also provide an insight into the diverse wildlife and ancient aboriginal culture that the Northern Territory is renowned for. Northern Territory holiday packages are a fantastic way to explore this amazing holiday destination in a safe, coordinated and affordable way. Bundling together everything from flights, accommodation and transfers to tours, meals, travel insurance and more, you can save money while making the most of this spectacular region. Enjoy peace of mind knowing that everything is taken care of and explore the Northern Territory with an existing holiday package of customise one specifically for you. The Northern Territory is an extreme environment home to mosquitoes and a range of insects as well as some dangerous wildlife including box jellyfish and its famous fresh and saltwater crocodiles. Rivers, billabongs, beaches and other swimming spots are generally signposted however if it does not state that the area is safe to swim, its best to avoid it. The Northern Territory is also very hot, dry and sunny so hats, sunscreen and plenty of water are advised.